Instagram has quickly become one of my favorite apps on the iPhone. It combines photography, social networking, and mobile in a seamless and fun way. It goes to show that even though Facebook is dominating the land of social, there's still room for innovation and niches. Although Instagram has been out since October, it still exists purely as a mobile app. No website and therefore no way to show off your Instagram "profile" (other than through individual sharing of pics via Facebook, Twitter, etc.). I had a sneaking suspicion that they had something in the works, so when Instagram recently announced their API, I was naturally excited. Why build out a web interface (although they probably will do that eventually), when you can release an API and harness the power of the developer community? Kinda cool but still nothing super special. 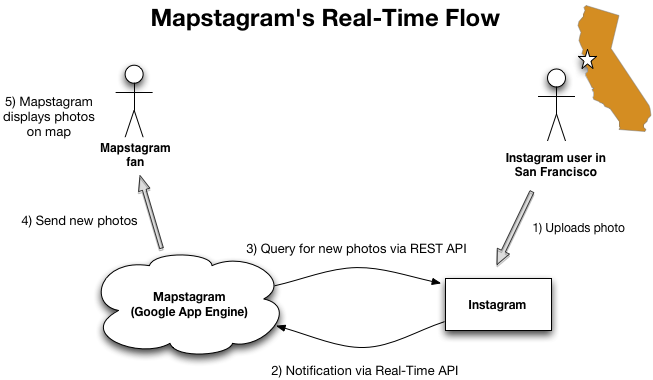 Then literally the next day, Instagram announced their Real-Time API. What this means is that you can subscribe to photos based on certain aspects such as tags, named locations, or geo coordinates, and whenever a photo is uploaded by a user that matches that criteria, you'll receive a notification from Instagram in real-time. Awesome sauce! And this is where the idea of Mapstagram took off. I began architecting a backend system to handle real-time updates from Instagram (technical details below), while my friend, Jochem Geerdink, worked on the creative and front-end side. 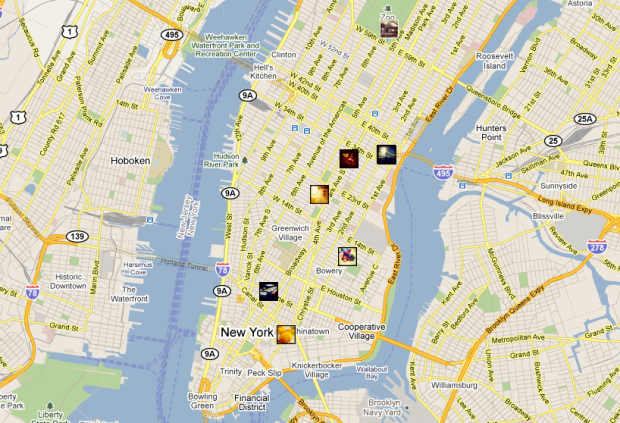 Together, we created a dynamic visual display of Instagram photos on Google Maps in real-time. Instagram user uploads new geo-tagged photo via his/her iPhone. Instagram processes this update , and immediately notifies all subscribers (such as Mapstagram) that are subscribed to that photo's geo coordinates. Mapstagram receives the notification, then queries Instagram for the new photo(s) in that geo location. Mapstagram sends these new photos to all connected clients. Photos are displayed on Google Maps, and added to the scrolling list of photo updates. Markers - I customized the markers by using Instagram's thumbnail URLs. At present, when you click the small image, I'm actually removing the marker, and creating a new marker with the URL to a larger image. Somewhat of a hack but it works - kinda clever no? I plan on changing this in the future. Events - I use the marker's "click" event to implement the aforementioned hack. Mapstagram started off with me goofing around with the Instagram API, and quickly became a fun 2-person project with Jochem. We definitely have more ideas and improvements that we'd love to add to Mapstagram, so hopefully we'll have the time and energy to implement them. Feedback is definitely welcome! Look for me (eimajination) and Jochem (orangeup) on Instagram, and add us to your friend list!